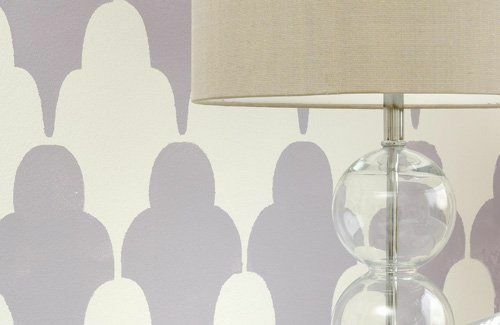 Cheaper than wallpaper - and more fun, too - stencilling lets you create your own designs for an individual look. If you're struggling to stencil, this step by step guide by Naomi Cleaver will set you straight. Prepare the wall and paint it, using a roller and leave to dry. Work out how many times you'll need to repeat the stencil to cover the wall and adjust the positioning so you will get a neat finish at the corners. Mark the position of the stencil with the pencil on the wall, using the measuring tape and spirit level for accuracy. Spray stencil mount on the back of the stencil or use low tack masking tape to secure it to the wall. Decant a small quantity of the coloured paint into a saucer or the lid of the paint pot. Apply the paint using the small paint roller. Stencil small or intricate designs using a stencil brush instead of a roller. Remove the stencil immediately and leave paint to dry. Repeat the process across the wall, following the marks on the stencil each time, to make sure the pattern matches exactly.